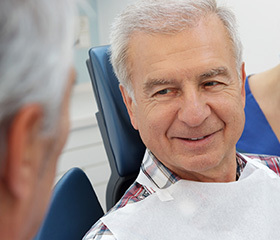 Your teeth are designed to last a lifetime with the right care, but there may come a time where you need to have a tooth extracted. At Water’s Edge Dental, Dr. Sean Bannan performs both simple and surgical tooth extractions in South Daytona. Although we try to prevent the need for the removal of a tooth, there are some instances where it is necessary to protect your oral health. If a tooth has been severely damaged, if complications with the wisdom teeth develop, or if the teeth are significantly overcrowded, you may need to have an extraction. Most often, teeth need to be extracted due to trauma, disease, or overcrowding. 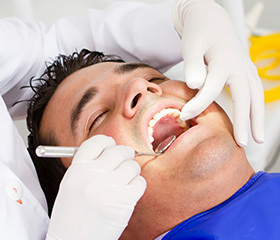 No matter the cause, you need a dentist who is specially trained in this procedure. Dr. Bannan and our dental team have the training and qualifications to safely perform simple and surgical tooth extractions. 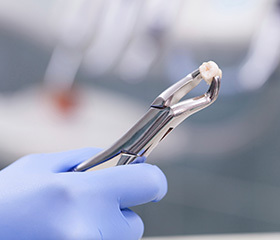 A simple tooth extraction is used when a tooth is visible above the gum line, such as the removal of a baby tooth or a tooth that has suffered damage. A local anesthetic is used to minimize discomfort. Then, the tooth is loosened and forceps are used to remove it. A surgical extraction is needed when a tooth cannot be seen above the gum line, such as impacted wisdom teeth or a tooth that has broken below the gum line. This is one of the most common surgical procedures performed in the United States. Since the tooth cannot be easily seen, the process to remove the tooth is a little more complex. In most cases, sedation is used to ensure your comfort during the procedure. The gum tissue is opened to expose the tooth. In some cases, such as the impaction of a wisdom tooth, surrounding gum and bone tissue may need removed. Depending the exact circumstances, the removal process will vary. In some cases, the tooth will be loosened and removed as a whole, similar to a simple extraction. 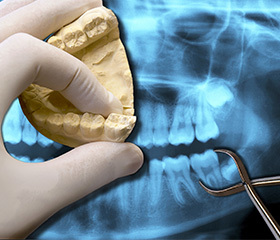 However, if the tooth is severely impacted, it may be broken into pieces and each piece will then be removed. The area will be cleaned from debris and the extraction site will be closed with sutures. You will be given strict aftercare instructions to ensure the area heals correctly. Wisdom teeth (also known as “third molars”) are the most common type of teeth that need to be extracted for the sake of the patient’s health and overall wellbeing. Because they are the last adult teeth to emerge into a patient’s smile, there usually isn’t enough room left for them in the mouth, resulting in them becoming partially or fully trapped within the jawbone. 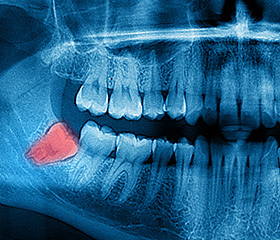 If they do emerge properly, wisdom teeth may cause dangerous overcrowding as well, and patients are likely to experience higher risks of infection. Dr. Bannan will be sure to keep a close eye on these developing areas of the mouth in young patients so that we can be well-prepared for signs of trouble and extract the teeth if it becomes necessary. The recovery time for simple extractions is minimal. You will need to avoid eating on the affected area for a couple of days and keep the site clean to prevent infection. If you required a surgical extraction, you will need to take care to prevent the blood clot from becoming loose, which can lead to a painful dry socket. In addition, you will need to eat soft foods for a couple of days and keep the mouth clean. If any pain or discomfort occurs, you can usually manage the symptoms with over-the-counter medication. Using cold compresses will minimize swelling and bruising. Within a few days, you will be fully recovered from the procedure. If it has been recommended you have a tooth removed, you need a trusted and experienced dental team by your wide. Our team at Water’s Edge Dental provides the tooth extractions you need to preserve your dental health. Contact our office today to schedule a consultation.